Join #TeamJJF! 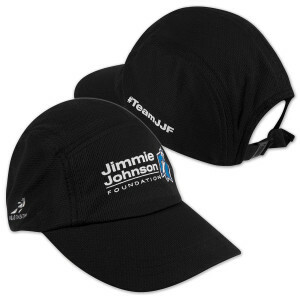 Support the Jimmie Johnson Foundation with the purchase of this HEADSWEATS Race Hat, just like the one Jimmie wears as he trains and participates in athletic events. This black Coolmax® Fabric shell and COOLMAX® Fabric terry headband create maximum air flow and moisture transfer. It has an adjustable rear buckle and is machine washable. The hat features the Jimmie Johnson Foundation logo on the front and #TeamJJF on the side. $5 from the sale of each hat will go directly to help fuel schools in need. There are a limited number available so purchase yours today. Great hat for running, exercising, and for traveling with. Folds up and is out of the way quickly. Wasn't sure I'd like it, but it's a different hat and I love it.